If you’re in the market looking for a strong and protective but loving dog breed, then you don’t need to look further. Our German Shepherd puppies for sale will fit the bill and here’s why. 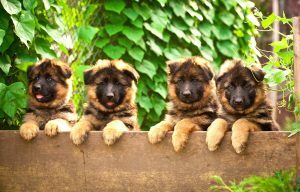 We have gathered some interesting facts about German Shepherd puppies for sale just for our readers! Many of our readers are very familiar with German Shepherd puppies for sale but really only in look and a few cliche reasons. Well, here’s an interesting fact for you! Their official name is German Shepherd Dog. They are one of the very few breeds whose official name includes the word “dog.” The reason it was incorporated into the German Shepherd’s name was to ensure there’s a distinction between the dog and human. Huh? There’s the German Shepherd human being who tends to livestock and then there’s the German Shepherd Dog! A Bite Bigger Than a Bark! You’ve heard the phrase “bark is bigger than its bite” right? Well, we’ve flipped it a bit to talk about German Shepherd puppies for sale! Sure, they have a powerful bark, but that’s nothing compared to its bite. One bite has 238 pounds of force! When you compare that to humans, it’s nearly triple the force at a mere 86 pounds of force. If you’ve been wondering how German Shepherd puppies for sale came to be in the United States, and quite frankly across the world, then you should know the name Max von Stephanitz. Stephanitz is considered to be the father of German Shepherd puppies. In 1899, he noticed a wolf-like dog with black and yellow markings, during a dog show in West Germany. Completely enamored and taken aback by the dog’s intelligence and discipline, he purchased one and started the German Shepherd Dog Club. German Shepherd puppies for sale are the second most registered dog in the United States. Their diversity stands out from the rest. Families, workforce staff, the military and show arenas all fancy them! They’re fierce, protective, loving, and worth every darn penny spent! At Furry Babies, we always have German Shepherd puppies for sale, and guess what…if we don’t have them at our location, we will always check our other stores for assistance.